With Rogue One, Star Wars just got real. 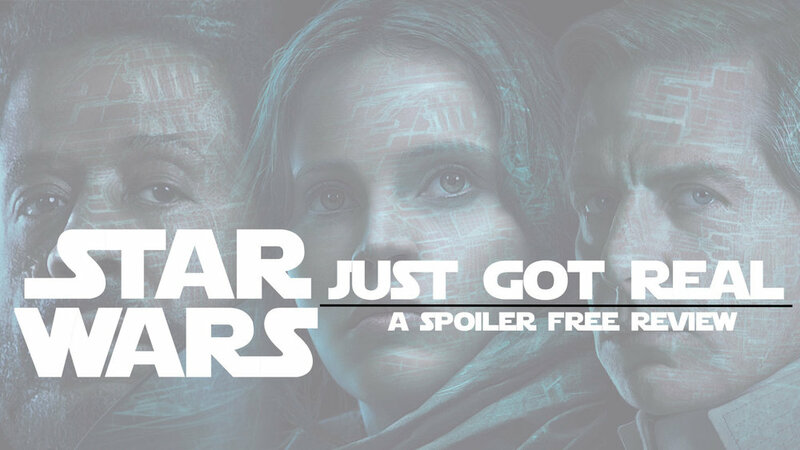 To give a spoiler-free review, I must boil down what I saw to general reactions. The one thought that sums up how I feel at this very moment can be conveyed in three little words. Yet, as simple as that idea is, Star Wars fans from all over the spectrum can take it to mean I am criticizing what came before. Just for the record, I am not. I would not be in a position to write a review for a Star Wars website if I didn’t love all the movies under the Star Wars banner. Yes, all. Real doesn’t mean it is necessarily better. It just means it is a different approach. Like comparing Tim Burton’s Batman to Batman Begins. Both are amazing movies. Burton’s is a visual feast of grandiose settings. The viewer is transported into a world befitting such larger than life characters. Batman Begins, still unbelievable, allows the audience to ask, “If Batman were real, what would that look like?” Which is better is simply a matter of taste. After this movie, we must reconsider some of the criticisms caused by an overanalysis of its forebearers. The memes of the inaccuracy of Stormtroopers and the weakness of their armor do not carry as much weight. Although the other movies have held to the same ring and poetry, breaking free to new path can add a freshness to a beloved series. We can apply lessons to our reality when we are reminded that defiance and wars have consequences, even for the good guys. It hopefully pulls us back from seeing war as only entertaining and distant, and it allows us to take seriously any decision to send our neighbors into battle. Diversity has been a topic in films for decades. Even in this time, the latest Academy Awards broadcast was haunted by the challenge of reflecting real human interactions. More and more, as the world shrinks, we must live our lives intertwined with many who are not exactly like us. As much media attention as the issue has received, the use of different looking and sounding people did not feel forced. The inclusion begged the question why has this not been the approach in the past. Although the answer is obvious, diversity still makes more sense. In a galaxy of many different species, why not have multiple types of humans? As humans populate many different worlds, why would there not be even more ethnicities than the amount on our single planet? Maybe Star Wars can help change this for other movies. Star Wars is so big, it does not have follow the rules. It does not need a big name star on the marquee. It does not have to connect the dots for certain demographics. It can lead studios to trust the audience. Give us a good story, and we will not care what the actors look like. In addition, diversity does not just mean skin color or accent. Not every freedom fighter does it as nobly as Luke Skywalker. Not every gambler can beat the odds as often as Han Solo. Not every leader is as steadfastly committed as Princess Leia. As for not needing big name stars, it allows the director to cast actors whose very presence is a distraction. Most filmgoers are not comparing these actors to their past performances or thinking about a tabloid headline about each actor’s personal life. We could just absorb the real performances, which are probably the best collection in any of the Star Wars movies. This goes for the music, too. I have heard discussions about how the score has been a character unto itself in the past. This is the first time John Williams has not scored a Star Wars movie. I’m not going to lie. No one can replace him, but Michael Giacchino did a good job. He did not overdo the music to a point it was distracting. He gave us his take on enough of Williams’ themes that we recognized it as Star Wars music. Honestly, upon the first watching, I did not notice the score very much, until the climactic end. At that point, he did his job perfectly. The entire movie is filled with realistic looking characters. The small rebel faction on Jedha look like the type of insurgents we would see in the Middle East. The X-Wing pilots standing around in the hanger have the appearance of men and women enlisted in our armed forces. As shiny and clean as the Stormtroopers’ armor is in A New Hope, the dirt on their armor in this movie conveys they were in a real fight. More amazingly, the droid K-2SO has a very lifelike quality. Advancements in technology makes him the most realistic droid in any Star Wars movie. It doesn’t mean we still can’t appreciate R2-D2 and C-3PO, but we are able to lose ourselves in K-2SO’s interaction with the cast without thinking about him being an actor in a suit. Even when we see characters we know are not really there, they seem amazingly real. Having read the novel Catalyst as a companion to Rogue One, there were times when I felt real heartbreak in the movie. You don’t have to read the book to enjoy or feel emotional about the film. I would suggest reading the book at some point to experience those feelings on a deeper level. But don’t delay seeing the movie to read the book first. Don’t walk. Don’t run. Swallow your pride if you have to, cross the line into another sci-fi franchise, and teleport to the theater. See this movie as soon as possible. It is that good.